We have had a number of dogs over the years. Their nicknames range from Crazy Kiki and Loveable Kaya, to Kipper the Ex-Crotch Ripper and Sweet Karma. Their nicknames give a clear indication of their personalities. Their names are practically labels. Diligently they worked at modifying the dog’s “genetic tendencies toward being a menace to society.” Of course, the poor pup lived under an iron fist and non-negotiable rules. Fear of an impending mauling struck the fear of doG in the family’s heart. Instead of socializing they shied away from other animals – they shied away from play dates, scared that some killer instinct would emerge. Of course, aggression did start to emerge. I would expect no different in any under socialized dog. By the time I met the dog, the owners were convinced that they had been cheated (they thought they had adopted a lab cross). They were grateful to the first trainer for being honest about the impending aggressive reactions. They felt that had they not been aware, they might have…gasp…put the dog into puppy classes. Suffice it to say that this was not a “Pit Bull,” puppy. Lack of socialization can lead to behaviour problems in dogs. It is more reasonable to assume that fear kept the owners from socializing their puppy. That lack of socialization is more likely to blame than some hypothetical genetic predisposition to maiming and killing. By the time I became involved, it was too late to change this family’s belief system. A hundred people could have told them that they owned a very normal mutt. It didn’t matter, their perceptions had been formed. They formed a self-fulfilling prophecy. Negative labels can wreck havoc with training goals. Low bars, gloom, and doom expectations generally lead to dismal results. Frustration and disappointment clouds the reality that most pups can be obnoxious and it’s normal to have to work through these problems. These are not “bad” dogs. They are young dogs. 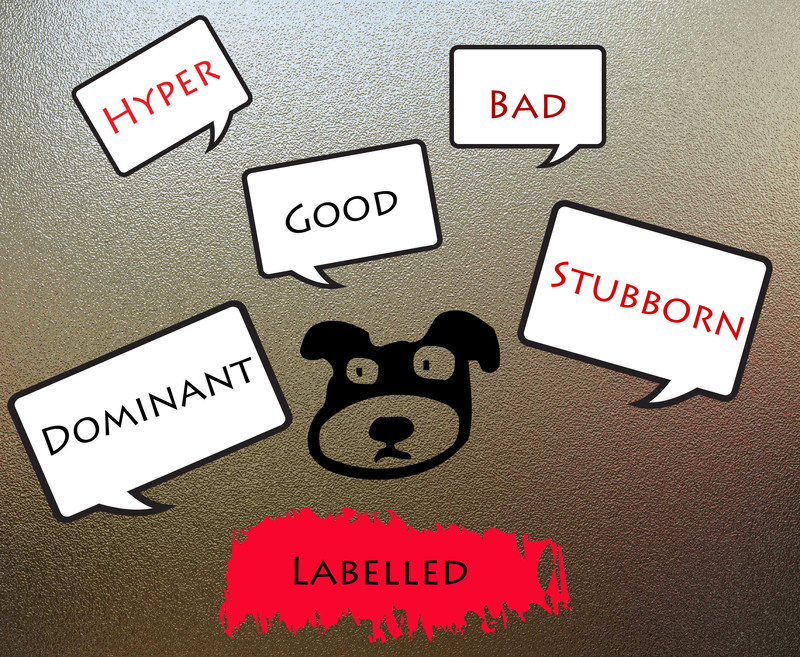 Trainers and owners often do label their dogs. “My dog is fearful.” “My dog is dominant.” “That dog is anxious.” “Our dog is bad.” That does not seem healthy if you get what you project. Researchers Rosenthal and Jacobson conducted an experiment in the 1960’s. Children from Oak school were evaluated with an IQ test. Subsequently those children were divided into random groups. The researchers then told the teachers that one particular group was ready to “bloom” intellectually. This group had potential. The teachers did not know that this was patently false. All the kids in all the groups were…average. Our expectations shape our results. This is called expectancy theory. Labels we place on others can improve results. Conversely, negative perceptions can hold students back. There is an element of truth to the idea of a self-fulfilling prophecy. Dog trainers and pet owners are teachers. Whether we like to admit it or not, we project our bias onto our dogs. We can choose to look at our pets as anxious, scared, reactive, bad, hyperactive, dominant, willful or stubborn and the dogs will probably fulfill that vision. What is your dog’s label? Focusing on what the dog is – today – could hold us back. Those words and labels have no goal, no purpose and no vision. We quit. We settle. We act according to our mind-set and expectations. We choose training strategies fulfill or play to our expectations. We might become overly assertive on the assumption that a dog is problematic. Others might coddle a shy dog, limiting social experiences. We become desperate when faced with the energy and youthful antics of an otherwise normal dog. An alternative is to label the dog with their potential. The dog is, “learning to be stubbornly obedient.” Perhaps the pup is showing, “potential to bloom with confidence.” Maybe we have a “chill dude in the making.” We can see the “high energy agility star in training” – the one that gets us up off the sofa. These are good things. I have an EX-crotch ripper. (Thank you to the person who added the ex to his nickname a few years ago.) Kipper the EX-crotch ripper is a more productive and optimistic version of Kipper the crotch ripper. Those names represent very different perceptions and goals. If you see potential, then setbacks are simply pebbles that stub your toe. We alter course and move on. I do not ever mean to suggest that we should minimize real dangers. I will be the first to point out a bona fide safety concern. We address it and adjust our goals. Today’s problems should not be tomorrow’s vision. I refuse to aim for a goal of nothing. I refuse to continue labeling a dog by its history, or the flaws of today. I will not settle when success is an option. The dog’s potential is the inspiration that can motivate us to keep going. Seeing the bigger picture can prevent anger, fear and frustration from setting in. If I were to be completely honest with myself, I know that I treat Kip and Karma differently. People who meet my dogs treat them very differently. Kip, although large and reserved draws people to him like moths to a flame. Protests fall on deaf ears. Strangers wiggle with fingers and tell all 70 pounds of him, “I don’t mind if you jump.” People encourage their dogs to run up to him. This really reflects my vision of fulfilling his potential of becoming a social dog. I treat Karma like a working dog. I reinforce her more quickly. People give me a wide berth. They call their dogs away from her. She happens to be the small, cute and cuddly dog. How ironic is that? My expectations create a culture that supports good behaviour. She learns to be attentive to me. I think we often get what we ask for and what we expect. If that were the case, why would we ever dwell on our dog’s flaws when we could re-frame our perspective, just enough to add a degree or optimism and potential? So tell me, what is your dog’s label? This is a very interesting article that brings up a good point. I call Bailey a ‘cutey’ and think of him as placid, yet Cooper, our other dog, is often labeled as ‘nervous’, which he is around other dogs. Max is my formal backyard dog and now my working service dog. dieter is my formal reactive dog, but is now my little dog I use to socialize big dogs with. Malcolm was Hoodlum, but has become Puppy Prodegy. Emma is working into the former hyper and fearful dog I work with. Jack is still dubbed Gentleman Jack. Though all of mine got nicknames, I never really saw labels, just potential. I have a client who has a Chocolate Lab Max who we believe many have some Pitty in hi,. I said to her that was wonderful because Pitties are smart, loving and loyal. She puffed up with pride. I have a friend who has a Pitty mix who is terrified of Pitties. I lied and said she doesn’t have an ounce of Pitty in her and he’s allowed her to become a fantastic family dog that he and his kids love. Had I not lied, he would have gotten his gun and shot her. The rest of his family, who also recognize her breed, also tell him she’s not because she’s a lively sweet dog! A label for her would have been death. I try not to label, but show people what wonderful potential their dog has. We have a beautiful long-haired GS. She’s very, very smart and has been able to learn all kinds of things, but she’s reactive to other dogs. Very disappointing as I didn’t want to have a dog like this (we got her when she was 1.5 yrs). I think it’s difficult not to label ourselves — I don’t want to be “that” owner. I have gone to “reactive rescue” with great trainers and now have the tools to train but it takes courage, persistence, and practice (on my part!). I don’t want to fail her. I can see incredible potential in her but not sure about me! I refer to my little man as Toby, Toby Joe, Cowboy (when he is doing really good on his training, I yell, “Come here Cowboy!” and he always comes running all happy and excited) and You Sweet Little Monster. Normally after he has torn something up. He is a 9 month old puppy and when he does get destructive its usually when I haven’t checked in on him for awhile and he decides he’s bored. Lovable, all four. 🙂 Dee-Dee (rhymes with Stevie which is his name). The Machine is Zoomie’s nickname as he never stops when playing. Bella the Papillion is “Evil or she who shall not be named” but that is a complete joke obviously, the juxtaposition of if is hilarious to us. Power is Powsie or Pow Pow. A good summary of why it is dangerous to label dogs based on preconception. Each dog is individual and needs to be given a chance to archive it’s true potential.